For all those who wish to open the veil of the mystery future, we offer psychic, Mancy and divination spells. Here are shown the magic products, which are able to tell you about what awaits you in the future. Spells for hydromantic divination, divination on glass, rituals of clairvoyants to help call special dreams, filled with information about the future. Moreover, there are spells and rituals that can develop extrasensory abilities, which are laid in you, but you do not even know about them. With the help of the products in this section, it is also possible to strengthen the influence of your energy power, to improve the gift of prediction, to activate the third eye and intuition. To create a working process with your Alter ego is also possible with these spells and rituals. Alter is able to help you making decisions, he can tell not only about the future, but also about the past, and specifically about your past life. Working with Alter ego will help to discover something new in yourself that was forgotten during reincarnation. As you can see, our spells have tremendous power, so try them right now. A vessel, of your choice, imbued with more than 150 Spells, all of a Psychic, Mancy, & Divination nature... such as: Psychic Power, Increase Natural Intuition, Powers of Clairvoyance, Powers of Clairaudience, Powers of Divination through Dreams, and more! This is an amazing tool for ANYONE as it increases, permanently, your psychic abilities on all levels! You are going to receive a great blend of 5 spells that are special to Ash & myself! Alice's Looking Glass is a spell-blend of multiple cultural spells through which you can see into other dimensions, realms, and even different layers of yourself! It is a passively aggressive blend of magick that takes you by surprise when you gaze into its mirrored vessel. You will have visions of other time periods, realms, dimensions... visions of entities, spirits, ancestors... and see into yourself & your many mortal, spiritual, and astral layers! A very comprehensive binding that Alice herself would be proud of! This spell allows you to see a visual manifestation of their alter ego through third eye, meditation, or sleep cycle. Often our alter egos are similar in appearance, but not exact, and working with our alter egos can unlock different aspects of ourselves that can be utilized in different times of need. This listing is for work Ash does annually for a psychic stamina ritual. The binding you will receive will be of Dark Arts energy & power. This will be a dynamic binding meaning the power & energy of the amulet will fluctuate between whatever starting class you choose (C4, C5, etc) up to Dynamic Class depending on what you are doing & how much energy & power the binding needs to expend to assist you in your efforts. If you choose Dynamic Class from the drop-down below then it will be a Dynamic only and will not give long, stationary class levels. You will receive this original creation by Ash through a download of a .pdf file. You will receive the instructions (very easy) & the image in a 2-page document. 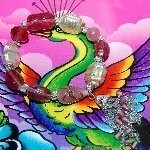 This bracelet is spelled with 10 Psychic Spells to enhance your psychic power, encourage lucid dreaming, enhance psychic visions, bring more accuracy in methods of mancy, sharpen intuitive thoughts, draw closer bond to astrological signs, inspire better connection during meditation, encourage psychic revelations about self & others, and enhance third eye energy for focal divination. The Carnac Stones... the largest collection of Neolithic menhirs in the entire world. While not as well-known as Stonehenge the Carnac Stones are every bit, if not more, amazing. Casting stones are gemstones used during the commission of conjurations, spellcastings, rituals, ceremonies, and the like. This amulet of the Castis Ritual is a ritual binding used to manipulate the power of Hydromancy. You will never look at water the same way again! Place the stone in any distilled bowl of water and place it within one foot of you. Allow your mind and body to completely relax and allow your mind to wander into a higher state of consciousness. Draw in a deep breath and focus your mind on what you wish the water to guide you with. This is a special binding where multiple tools were used to develop this channel. It is a channel to the Akashic records allowing a deep connection to the spirits & spiritual realm using a method of Mancy (Divination) and Spiritual Travel. It is best to use this binding during meditation or sleep. The channel is opened by speaking the word "Telifa" (Tel-e-fah) and closed with the word "Jona" (Jo-nah). There is much that can be learned in working with the Askashic records and considering the vast expanse of these records you can work with this piece a lifetime and it will grow with you as your abilities develop. This binding allows you to Channel any energy you desire into yourself or others. It can be energy from a spell you cast, a spelled vessel you have, and it can Channel the energies of spirits and entities in your keep. If you need a boost of psychic energy you can have the energies of your divine angel or a psychic spell Channeled through your 3 bodies. If your loved one needs a boost of cleansing energy you can have the energies of your Waif Faery or a cleansing spell. You have the control to Channel the energy into one, two, or all three of your bodies or the bodies of someone else. This gives you targeted control for the best results! You can also program it to provide the energy on a temporary or permanent basis. This binding empowers your Clairvoyant abilities and powers. It will provide you intense, personal, and insightful visions that make a great deal of difference for your future. You will see into your life, the lives of loved ones, and perhaps even lives of strangers. This provides a powerful gift for you to be able to understand and see vivid, accurate, and effective visions that can make a profound difference for your future. You will find yourself receiving spontaneous and powerful insights that can be more engaging, more vivid, and more amazing for your pursuits of understanding the relationship between life & time. This life binding is for helping you to determine what kind of day you are going to have. It is a method of divination with a set of colored vessels which helps you to know what kind of day you can expect. This enchantment is a powerful, Grecian ritual which bestows Oracle power within you at an intense & significantly influential rate for up to 48 hours at a time. You will feel an amazing flush of energy bubble within you and you will receive revelations and psychic visions appear within your third eye, your dreams, and your third eye. The revelations you receive may be life-changing or necessary to understand events and situations within your life or within the Universe. You will feel an ancient bond and tie to the Oracles, receiving incredible visions, lucid dreams, and revelations that bear personal significance for you and your loved ones. This is for one Connecting Stone of your choice that assists you in connecting with spells & magick of different varieties. You can hold the stone while working with your enchanted piece, put it in the Charging Box with your enchanted vessels, use it during meditation or while you are casting a spell its related to, or just keep it in your home to help amplify the connection & usage of spells related. This beautiful turquoise leaf is an amulet imbued with enchantments to bring you a closer relationship to the Earth's power & the Elements through your current & all past life achievements in grounding. If there is a spell or enchantment you are looking for and you cannot find it in the store anywhere else please use this listing.